Getting married in Winter? These wedding invitations are perfect for a Winter themed wedding. The delicate white mulberry paper that was used to encase the invitation gives this invites a translucent snowflake like effect. This was Debbies very own wedding invitation for her January wedding on South Beach. It was made with a shimmery silver cardstock, white fused lace mulberry paper, and 3/4 inch organdy ribbon for a "wintery" feel. Cut the three layers to size with a paper trimmer. The wording was centered and printed on to the white linen card stock. I created and printed the invitation using MS Word and my home ink jet printer in a grey color. Each of the three layers were centered on the layer beneath and adhered together with mounting tape. If you have a glue runner this will help you get the gluing done a lot faster. Take the 12.5x6.25" mulberry paper. 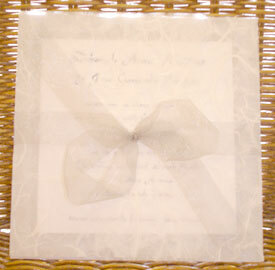 Center the invitation and wrap it in the mulberry "envelope," bay folding the sides over. Take a length of the organdy ribbon and tie it around the invitation forming a bow at the front. 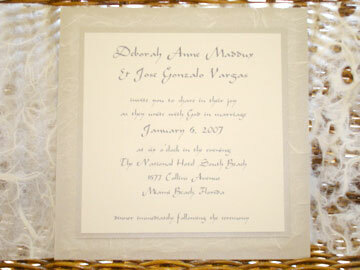 Return from handmade Winter Wedding Invitations to Make your own wedding invitations.